【化学】 ルテチウム 《金属元素; 記号 Lu》. From Latin Lutetia (“Paris, the capital of France”). A metallic chemical element (symbol Lu) with an atomic number of 71. Lutetium ( /l(j)uːˈtiːʃiəm/ lew-tee-shee-əm) is a chemical element with the symbol Lu and atomic number 71. 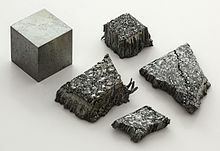 It is the last element in the lanthanide series, which, along with lanthanide contraction, expalins several important properties of lutetium, such as its highest among lanthanides hardness or density. Unlike other lanthanides, the element lies in the d-block of the periodic table; however, lanthanum is sometimes placed on the d-block lanthanide position. Chemically, lanthanum is a typical lanthanide: its only common oxidation state is +3, seen its oxide, halides and other compounds. In an aqueous solution, like compounds of other late lanthanides, soluble lutetium compounds form a complex with nine water molecule.